For the past few years, our family has spent New Year’s Day at the beach with good friends. I can’t help but find a pure kind of joy there. In the feeling of a fresh start as I look out at the unlimited horizon. In the sound of our kids squealing with delight as the freezing cold water dances on their pale winter legs. In the surrendering of my thoughts to the natural rhythm of the waves — somehow totally predictable, yet totally unpredictable at the very same moment. In the taste of the gifts from the sea as we gather around a table together. All of my senses come to life by the ocean. This year, as I stood watching the water move up and down and in and out, I couldn’t help but reflect on something I’d read awhile ago, though the exact location and wording escapes me. The idea of the devotional was that a ship, when firmly anchored, sits steady in the water. But, should someone let out more rope, causing the ship to move further from the original anchor point, the water becomes more turbulent and the ship must sit in those bigger, rocky waves. The analogy, as it was written, was in the context of religion, but I’ve found it to be profound in general. It’s had me thinking often about what anchors me — in my family, in my life, and in my writing. It’s forced me to really think about my journey to greater happiness in all aspects of my life. While I have yet to come up with a concrete answer, I’m working towards it. And I will continue to do so throughout the year as my vision and purpose becomes more clear. This is the year I will act with intent — with the ideals that anchor me constantly in mind as I go. When it comes to our family, my intent is to create a more peaceful home. I don’t mean quiet, per se. While there will certainly need to be those moments of silence to still our minds and ease our souls, I also find dancing to overly loud pop music to be outrageously calming. And belly laughs? There’s always room in my world for more of those. To me, a peaceful home is one where everybody feels their hearts are held with care and their minds are open to explore. If you ask anyone in my family, they’ll tell you that they’ve heard the word “peaceful” more in five days than they did throughout all of 2014. I’m taking this seriously, and forcing them to as well. Each of us is learning what we can do to help make our home a happier place for everyone else. We have our work cut out for us — me, especially — but I feel good about the adjustments we’ve made so far. And, from what I can tell, everyone else in the family does too. 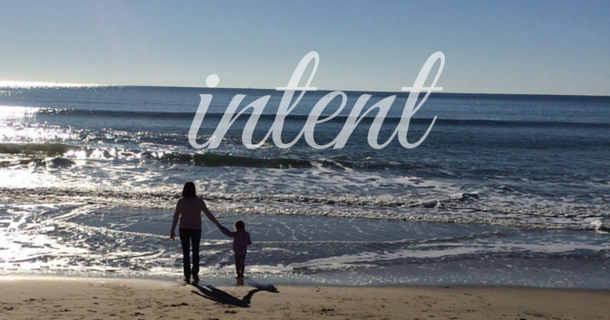 When it comes to my life, my intent is to act with purpose. While my brain tends to work on many things at once, it makes for a chaotic approach to the world. I’m constantly leaving things half done, losing important papers, getting distracted by a quick glance at social media streams as I wait for my tea in the microwave… I love that my brain is so analytical and busy, but I can’t help but think if I calm what goes in, the product that comes out will also be more organized. As I mentioned a couple months ago, my phone is a constant distraction for me. So that’s one area where I’m focusing my changes. In the past, when I’ve thought of something, I’ve quickly picked up my phone to create a calendar alert, send a quick email, make a reminder note, or look up something online. In order to streamline my time and thinking, I’ve bought a small notebook that I’ve been trying to keep with my phone. So, rather than “logging in” for small moments every few minutes hours, I’m going to go online with intent, referring to my list of things that I want to do while I’m there. I truly believe there’s nothing wrong with getting lost in my Facebook feed — if that’s what I’ve gone there to do. It’s the times I didn’t actually mean to that get in the way. When it comes to my writing, my intent is to create more meaningful content. Each day I’m overwhelmed by all that I read in social media streams and in the blogosphere. When you come to this space — when I come to this space — I want it to be because I have something significant to say. Sometimes it will be for a laugh, sometimes it will be with heart, but I strive to ensure that every time will be with purpose. Not because it’s a certain day of the week (I had pondered doing daily themes because that’s what bloggers who want to drive up their numbers do). Not because I become a better writer the more I write (that’s my work to do, not yours). And not because a brand is asking me to share their message (unless I can bring you true value too). So here’s to good intentions, peaceful moments, and meaningful interactions in 2015. I’m so honored that you’re a part of my journey and I look forward to connecting more in the year ahead. What an excellent way to bring in the new year! Happy New Year! Thanks, Linda! Happy new year to you, too! Very inspiring! My word– well, phrase–is the same I had in 2014 and it went well so I’m sticking with it. They are: DO THE WORK. And it relates to intentionality as well. This was great, Amy! Ooh, I like that too, Nina. Do the work is more than intent, it’s accountability. And goodness knows I could use some of that. Happy New Year!